In English, you don’t have to look far to find pairs of words that look or sound similar. Just think of their vs. there, empathic vs. empathetic, and compose vs. comprise. 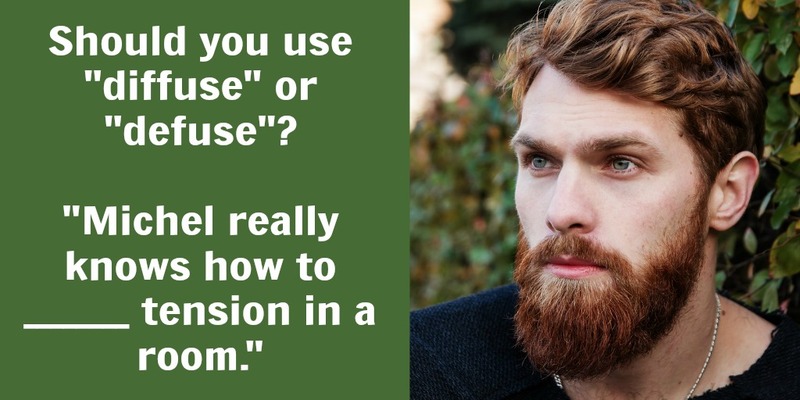 In some cases, you can use both words interchangeably because they mean the same thing. In other cases, though, you can’t swap one word in the pair for the other because the two words mean different things. Which category do diffuse vs. defuse fall into? Take a guess and find the answer below! When you’re trying to remember the difference between diffuse vs. defuse, remember that diffuse represents the idea of spreading something out. Defuse may look less familiar to you, but it isn’t some sort of abstract term you would find only on the SAT. What does it mean? Well, the primary definition of defuse is to take the fuse out of a bomb. But you can also use defuse figuratively to describe reducing the tension or danger in a situation (i.e., deactivating a figurative bomb). When you’re trying to remember the difference between diffuse vs. defuse, remember that defuse represents the idea of reducing danger or tension. How can you keep diffuse vs. defuse straight? You can remember the difference between diffuse vs. defuse by remembering what they mean. Of course, even if you remember the definitions of these words, you might not remember which definition matches each word. Lucky for you, though, there’s another trick you can use. Take a look at the word defuse. Do you notice anything? If you break down the word defuse, you get de + fuse, which means to take the literal or figurative fuse out of something. So all you need to do is remember that the word that literally says “to take out a fuse” (“defuse”) is the one that describes removing danger or tension in a situation. That’s not too bad, is it? Is it always wrong to use diffuse vs. defuse interchangeably? So although not everyone believes you can use diffuse vs. defuse interchangeably, it may eventually be common to use these words this way. Diffuse vs. defuse sound the same and look similar, but they generally mean different things. Use diffuse when you’re talking about spreading something out and use defuse when you’re talking about reducing tension or danger. Confused about the difference between may vs. might? Check out our recent post on when to use may vs. might in a sentence.